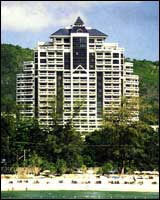 60/12 Rad-U-Tid Song Roi Pee Road, Patong Beach, Phuket Surrounded by luxurious land-scaped gardens in Patong Beach. The Andaman beach Suites Hotel houses luxury suites with large balconies overlooking the Patong Bay and The Andaman Sea incor- porating an all view concept. The Andaman Beach Suites Hotel offers comfort and luxury in the gentle embrace of nature and is only a short stroll from Patong's famous lively entertainment center. The Hotel presents an array first class accommodation of 4 different categories to suite individual requirement and budget. All Rooms from the Mini-Suite to the Family-Suite are a statement of luxury with all amenities such as Air conditioning, IDD Telephone, Satellite TV, Mini-bar, Personal Safe and large bathroom with long baht and shower with all luxuries that you would expect from a top-class resort. Our large Swimming Pool with Jacuzzi and separate Children' s Pool invite the whole family to spend a fun day outdoors. At our recently opened Spa get away from it all and treat yourself to one of the soothing massages, facials and treatment offered. The Suites Restaurant offers you a wide selection of international and cuisine. The Poolside Snack Corner serves your favorite snacks and variety of drinks. A Fitness Center, a Sauna and two Tennis Courts are available for our health conscious guests. Our Kids Room is always a popular venue for your children while you are relaxing right in front of those rooms reading books from our Library and Internet corner or sipping drinks from our Lobby Bar. The spacious Lobby is equipped with communication facilities for your convenience. Our conference Room can be converted into an ideal venue for business meetings as well as private parties.